​Nadal was nowhere near his best, but are we seeing the makings of Berdych 2.0? After rolling through the first two sets losing just two games, Berdych was tested in the third set. We've seen him collapse in those moments -- he came in on a 17-match losing streak to Nadal -- but this time he stuck to his aggressive game plan and did not waver. The Czech hasn't lost a set in five matches. It's been fun, Nick, but no one loves dousing a fire like Andy Murray. The Brit was in full control en route to a 6-3, 7-6 (5) 6-3 win over Kyrgios on Tuesday night to advance to his fifth Australian Open semifinal. Murray hit 48 winners to 28 unforced errors while winning 80 percent of his first serve points and 67 percent of his second serve points. That was a veteran performance from Murray, who will play Berdych for a spot in his fourth Australian Open final. ​Hold off on all those "passing of the torch" pieces. Sharapova slammed the door on Bouchard, taking control of the match early and never letting go to win 6-3, 6-2 in 78 minutes. 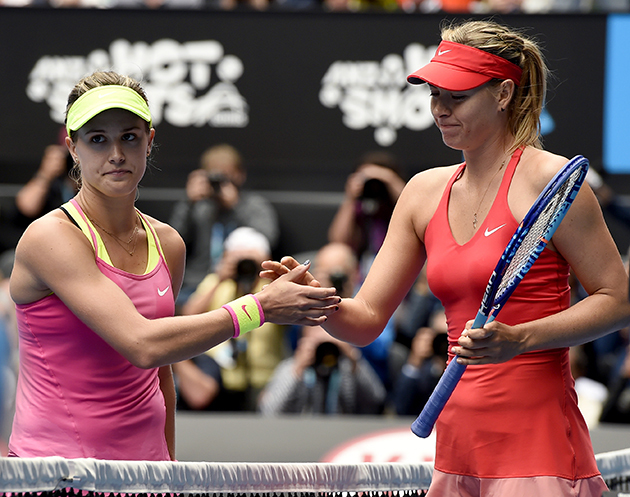 Bouchard vowed to be more aggressive this time against Sharapova, but she couldn't find the court. The Canadian misfired on 30 unforced errors and looked rattled in the second set. It Sharapova's best performance of the tournament -- let's not forget, she was a point away (twice) of losing in the second round to No. 150 Alexandra Panova -- and it sets up an all-Russian semifinal against No. 10 Ekaterina Makarova. After the match, Sharapova revealed a tough-love call from her father Yuri lit a fire under her. "In a nice version, it was like, 'This is unacceptable,'" Sharapova said, describing the call she received after that narrow second-round escape. "He's like, 'It is much easier just having a normal home life. You should try it. I don't know why you're suffering out there for nothing. Make it easier for yourself.'" "I actually think he's absolutely right," Sharapova said. "Deep down inside, sometimes it's encouraging to hear that because no one will tell you that. I like to hear that. I like coming off the court and hearing how it is. It's what I appreciate from my team. And Sven especially, he's critical, but in a great way. In my career, I've gone through a few different coaches. I like real people and honesty. I appreciate that very much. I don't need to go around the corners and people telling me, You're great; you'll improve in the next one. If you played a terrible match, you played a terrible match. Go out there and change whatever it takes to turn things around, because you're not going to win the tournament that way." No one was talking about Makarova before the tournament, but the No. 10 is back in the semifinals of a Slam after dismantling No. 3 Simona Halep 6-4, 6-0. Halep, who was playing in her fourth Slam quarterfinal, said she felt strained before the match and couldn't shake it. "I practiced very well in the morning, but maybe I was a little bit too stressed before I started the match," she said. "Wasn't my good day. I had a bad day." Nadal played a bad match. It's ok. You can say it. "If doesn't exist in sport. That's the real thing. If, if, if - never comes. The thing is, you have to do it. I didn't have the chance to play the fourth; I lost the third, so that's it. That's sport. I lost the third. He's happier than me in the locker room. I am not very happy because I didn't compete the way I wanted to compete the first two sets and that's something that I don't like."